First trailer for the light-hearted superhero movie. Warner Bros' screen adaptations of DC comics have become known for their dark tone, an aesthetic choice that has even been mocked in movies like The LEGO Batman Movie and Deadpool 2. 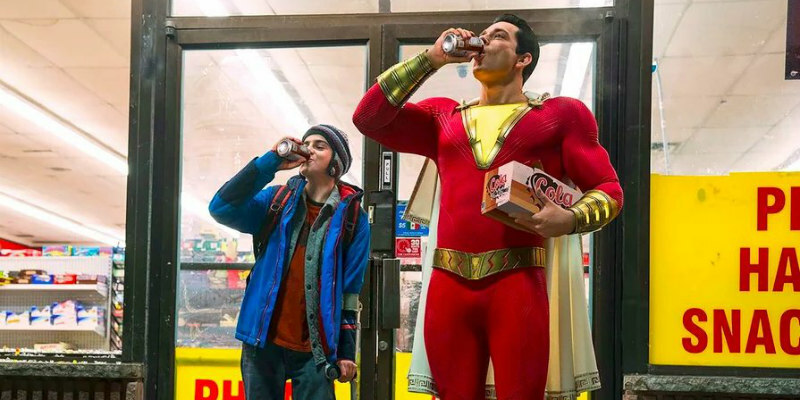 To counter the moodiness of Batman and his cohorts, DC now gives us Shazam!, the story of a boy (Asher Angel) with the ability to become an adult superhero (Zachary Levi) by shouting the titular phrase. Every hero needs a villain of course, and his nemesis comes in the form of Dr. Thaddeus Sivana (Mark Strong). Directed by David F. Sandberg (Lights Out), Shazam! is in UK/ROI cinemas April 2019. You can check out the first trailer, fresh from San Diego Comic-Con, below.